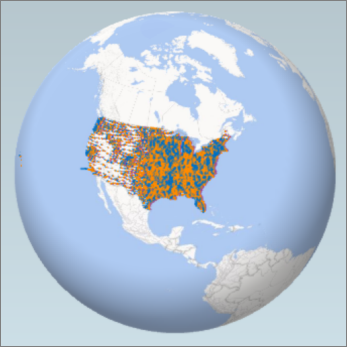 Microsoft Power Map for Excel is a three-dimensional (3-D) data visualization tool that lets you look at information in new ways. A power map lets you discover insights you might not see in traditional two-dimensional (2-D) tables and charts. You’ll find the Map button in the Tours group on the Insert tab of the Excel ribbon, as shown in this picture. If you can’t find this button in your version of Excel, go to I don't see the Power Map button in Excel. If you have a subscription for Microsoft Office 365 ProPlus, you have access to Power Map for Excel as part of the self-service business intelligence tools. Whenever any new Power Map features and performance enhancements are released, you'll get them as part of your subscription plan. To learn about the Microsoft Office 365 subscription plans, see Explore Office 365 ProPlus and Compare All Office 365 for Business Plans. If you previously installed a preview version of Power Map, you’ll temporarily have two Map buttons on the Insert tab: one in the Tours group and one in the Power Map group. Clicking the Map button in the Tours group enables the current version of Power Map and uninstalls any preview versions. For information about using your own data, see Prepare your data for Power Map. 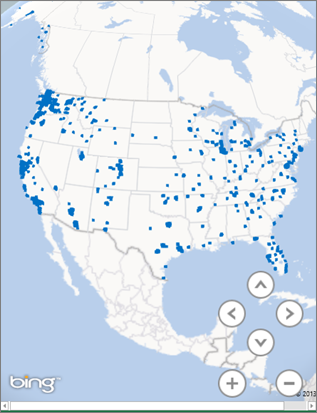 Click Next to start aggregating and further visualizing your data on the map. Our sample datasets are a great way to try out Power Map. Just download one of the following workbooks that already have the necessary geo-spatial entries you need to get started. Both the Dallas Utilities, and Food Inspections in Seattle downloads have time-stamped data, which allow you to view data over time.